If you visited the nursery class at Carterhatch Infant School, you would see 45 children who are purposeful, calm, confident and independent. You would see adults moving to where the children are engaged and interacting with them as they play. You would see a superb environment that is equipped to meet the needs, interests and stages of development of each child. You would see children who are making outstanding progress. You would not see any forward planning, nor would you see any focus activities and you would not see adults telling children which activity to do. To work in this way involves complex arrangements and yet the reasoning is simple. After more than 25 years teaching I am confident that this child-led approach to teaching in the early years (including Reception) is best for the children. Children are born with a natural desire to explore and learn and practitioners can support them in this. We do this by creating an enabling environment (both physical and emotional) and through the relationships and interactions that the children experience. We do not plan ahead, rather we remain “in the moment” with the children as they explore and learn. We observe carefully, and enhance the learning whenever we spot a “teachable moment”. Our observations, interactions and the outcomes are recorded afterwards. This is a simple message – Let the children choose what to do, join them and support them in their pursuits and then write up what has happened. The rest of this book will explain in detail how this looks in practice and what outcomes are achieved. For anyone about to abandon this book already, let me state that I have been through four Ofsted inspections since adopting this approach (with two under the revised EYFS and new OFSTED framework) and on each occasion my early years’ department has achieved “Outstanding”. That is without any forward planning and without any focus activities. What is more important is that, since adopting this approach, I have seen happy, relaxed children making accelerated progress as well as staff who are relaxed, inspired and enthusiastic, having regained a love of their job. It’s a “win-win” approach and I would urge you to read on. Babies are born with billions of brain cells and with stimulation these cells connect and form synapses. This is brain development, this is a child making “progress”, this is when a brain is “lit up”. Without stimulation the brain will not develop fully. This has been illustrated all too starkly in the case of the children from the Romanian orphanages. These children were fed and clean but they were left in cots without interaction or stimulation, for up to three years of their lives. Their brain scans show huge gaps in their brains, particularly in the temporal lobes – areas which regulate emotions and receive input from the senses. These children struggle to develop empathy and have cognitive delays. It is vital, therefore, that young children are stimulated and that the opportunities for synapse development are maximised. We need their brains to be “lit up” as much as possible. Brain activity and synapse formation are at their highest when a child is deeply engrossed in something which fascinates, challenges and makes them happy. Every child is unique and we cannot predict or impose what will spark that deep fascination. Each child is at a different level of development and therefore something that will challenge one child will be mundane for the next. Equally one child will be at their happiest digging in the mud while another will enjoy sitting and drawing a wonderful picture. We need to organise the setting so that each child can excel in their own unique way. We do not need brain scanners to know when their brains are developing or “lit up”. We can use a very simple measure:- The Levels of Involvement Scale developed by Professor Ferre Laevers. The scale has five levels (see appendix A). Level 5 is high level involvement and is characterised by the child showing continuous and intense activity with concentration, creativity, energy and persistence. Deep level learning , with many parts of the brain “lit up”, is known to occur when children operate at this level of involvement. In contrast, low level involvement (Level 1) is characterised by activity that is simple, stereotypic, repetitive and passive, with little or no challenge and with the child appearing absent and displaying no energy. When children are operating at this level, there is very little brain activity and minimal learning. These 5 levels of involvement can be used to assess individuals, groups or a whole class. Ferre Laevers also has a scale for the assessment of “emotional well-being” but experience has shown that the two scales are very closely connected. For example, a child who is consistently displaying low level involvement, in spite of an outstanding environment and excellent practitioners, is very likely to have some emotional problem – perhaps related to an issue at home. However, the assessment of the level of involvement is the first step in assessing an individual or a setting. Anyone who visits our nursery (or Reception classes) comments on how calm and purposeful the children are. They are actually assessing the levels of involvement, the amount of brain activity and the amount of progress that is happening. They can see that the children are not stressed and nor are the staff. (Stress causes areas of the brain to shut down and therefore development is hindered). The children are displaying high levels of involvement and so are the staff. I will endeavour, through this book, to explain how this can be achieved. There are 11 chapters in the book – one for each month of the year that the school is open. Most chapters are divided into three sections:- The first section looks at general, organisational, practical or theoretical issues – such as data, adult roles, toilet training, induction and budgets. These may be related to the particular month in which they appear or they may be on-going issues; The second section is devoted to the description of various aspects of the physical environment. In order to meet the needs, stage of development and interests of each child, the provision and resources are crucially important. This is why a large proportion of the book is devoted to this subject. The third section is a diary of the events from that particular month – illustrating the teaching and learning that is happening constantly. This includes the interactions between the staff and the children and between groups of children as well as examples of the independent learning that occur. Any early years setting is a highly complicated organisation and everything has to be in place to achieve an outstanding outcome. I would like to give all the information at once. Each piece of information forms part of the whole picture and although you can dip in and out of each chapter, I hope you will read the whole book to ensure that you understand the complete rationale. My role at Carterhatch is Assistant Head Teacher for Early Years. I manage the nursery and reception classes. There are three reception classes with 30 children in each and they are run in exactly the same way as the nursery (except for ten minute phonic sessions each day in reception). The school has two children’s centres attached to it, one of which is on the same site as the school. The 3-5’s provision for this children’s centre is based in the same room as the school nursery and caters for 16 children at any one time, with two members of staff. The school nursery class has 60 children on role (30 morning and 30 afternoon) with a teacher, Jacqui Granger, and three support staff. Therefore, at any one time, there are 46 children and six staff in the nursery room and garden. All rooms at the children’s centres are organised in line with the messages in this book – no forward planning, an outstanding environment, responsive adults who work “in the moment” with the babies and young children, and written accounts of the teaching and learning that occur. As I write this book, we are working under the revised EYFS and a new Ofsted Framework. Everything described in this book meets the current legal requirements – the recent Ofsted inspections confirm this. However, more important is the fact that we are delivering excellent early years practice which is best for the children. Going forward, we will continue to do what is best for young children, even if it conflicts with government decisions. As practitioners, we need to be passionate and determined in our defence of best early years practice. The “top down” pressure for the “schoolification” of the early years is intense. We need to demonstrate that children can achieve outstanding progress by playing, following their hearts, pursuing their interests and taking risks. The environment and interactions that we offer are crucial in this endeavour. I hope this book will help practitioners feel confident and inspired to trust that children do have a natural desire to explore and learn. The book should also give ideas on how best to support children’s exploration and learning through the environment and the interactions that we offer. I have used Anna’s philosophy and her approach to learning for the last 3 years and I love it!! 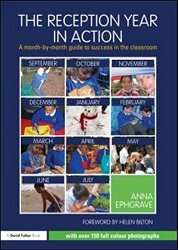 She has been an inspiration and I am so pleased that the nursery year in action has been released! I am a Nursery teacher in a Primary school. Reading this is like a breath of fresh air! It is just what I needed to see! This is how I try to work and how I want to work in my room but the pressure to do it more formally is intense! I am not formally EY trained (5-11 PGCE) and so do doubt myself despite the positive feedback I get from parents and staff. I don’t want to be getting them ‘ready for school’. I want to be teaching them what they need to be exploring and learning about for the stage they are at. I HAVE to order this book! Thank you! I’m so glad you’ve found in useful CC. Have you see. The video? I posted it last night? I will look now. Thank you. Re-iterating the above comments, a fantastically inspirational read! Already ordered and it’s in the post! !